I love this for a couple reasons. For one, it looks extremely badass. Secondly, for those who haven't caught wise, I have an advanced degree and career in higher education. I won't get all thesis on you, but I do believe that colleges--particularly public colleges--exist to serve the greater societal good. As such, it's great when states embrace their institutions of higher education and vice versa. I especially like when schools that aren't the flagship feel empowered to use the state's images or likeness. I'm also a geography nerd, so the state outline speaks to me. Similarly, the vexillology nerd in me really enjoys College Park's MD flag end zones and Clemson and Carolina's battle over the palmetto and crescent. In a similar vein, I've thought I'd love to see UMBC incorporate the MD state flag in some way, even if it's just the Calvert banner black and gold as used in the Baltimore flag. The confederates in College Park can have their red and white. 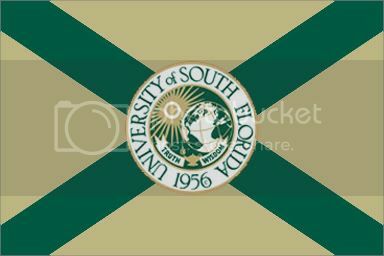 Some time ago, I also put together a green and gold mock-up of the Florida flag with the USF seal.